Fractions are one of those math topics that my students consistently need practice in. I try to mix up the fraction activities and printables my students complete to keep them engaged and working hard. 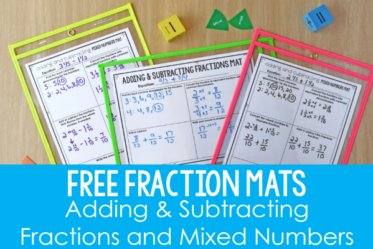 This post will share some free fraction math printables that are perfect for extra practice and math centers. 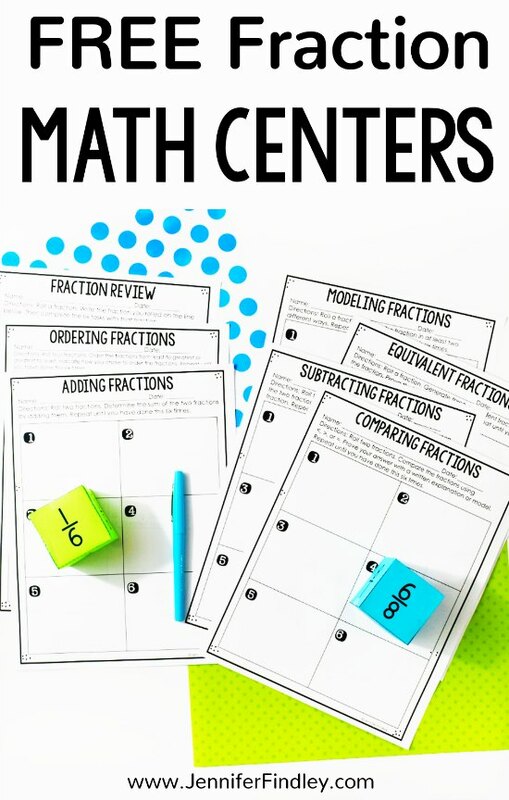 (Click here to read more about how I teach math here and how I incorporate math centers into my instruction). Fraction Printables —> Download at the end of this post. 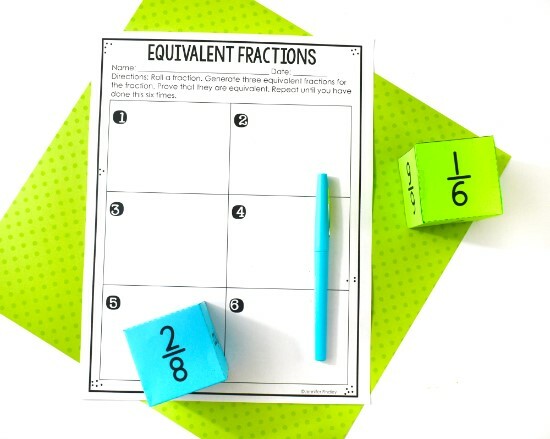 The students will use the included cube(s) to complete the printable fraction activities and practice a variety of skills involving fractions. They will roll the cube(s) that you choose to get a fraction that they will then use to complete a task. 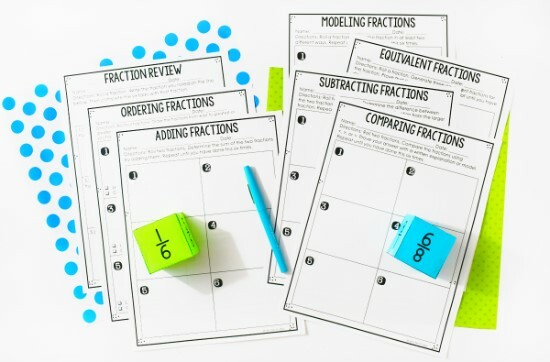 They will continue to roll fractions and complete the same task with a different fraction until the printable is complete (six tasks per printable). I have included four different types of cubes in the file and then a blank one for you to make one that best fits your needs. Cube 1 – Denominators are all 8 —> This is best for 4th grade standards for the adding and subtracting printables. Cube 2 – Denominators are all 6 —> This is best for 4th grade standards for the adding and subtracting printables. You can use just one cube or print several of them and mix and match to offer more variety and differentiation/enrichment for the students. 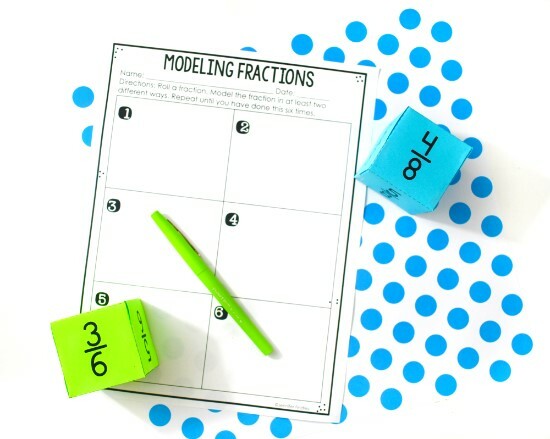 For this printable, the students roll a fraction and draw two models to represent the fraction. 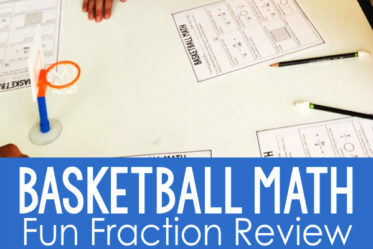 This printable requires the students to roll a fraction, generate three equivalent fractions for the fraction rolled, and then prove their answers. 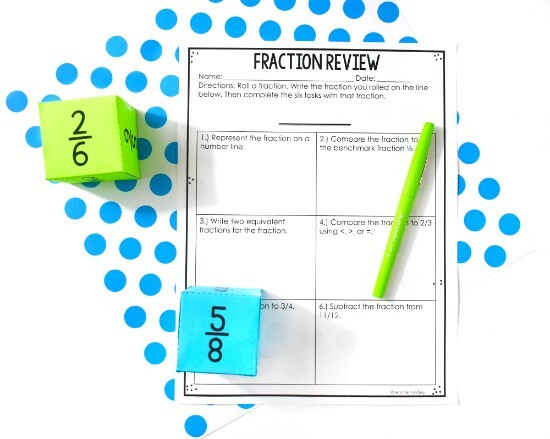 For this fraction activity, the students roll two fractions (from the same cube or using two different cubes), compare the fractions rolled using <, >, or =, and then prove their answer with a written explanation or model. The students roll four fractions from the same cube or multiple cubes and then order the fractions from least to greatest or greatest to least (student choice). 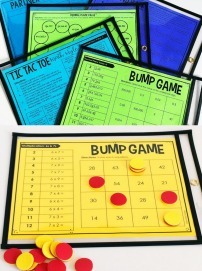 They will also indicate which way they chose to order their fractions on the printable. For this printable, the students roll two fractions and add them together to determine the sum. 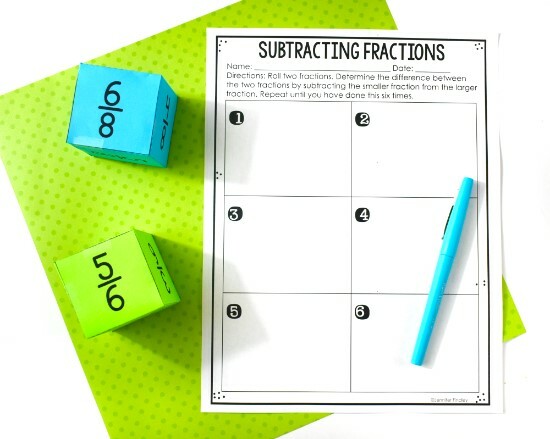 Similar to the Adding Fractions printable, the students roll two fractions and then determine the difference by subtracting the smaller fractions from the larger fraction. Representing the fraction on a number line. Comparing the fraction to 1/2. Writing two equivalent fractions for the fraction. Comparing the fraction to 2/3. Adding the fraction to 3/4. Subtracting the fraction from 11/12. Due to the last two tasks, this review is better suited for 5th grade or as enrichment for 4th graders. 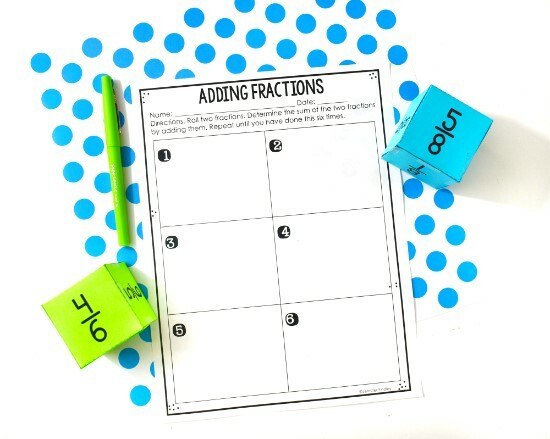 Need More Fraction Activities and Math Centers? 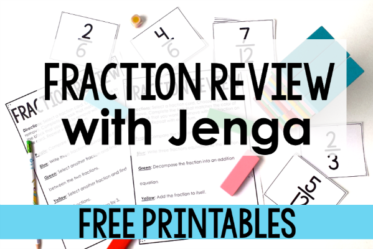 Grab the FREE Fraction Activities Here! 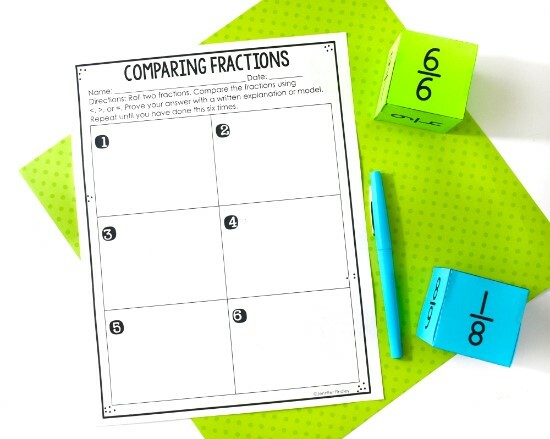 Click here or on the image to grab these fraction activities for FREE! Thank you! 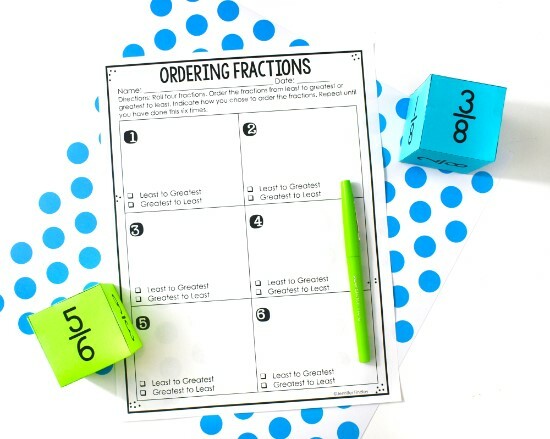 I was looking for another hands on fraction activity this morning and this popped up in my email and is perfect! Thank you! Thank you!